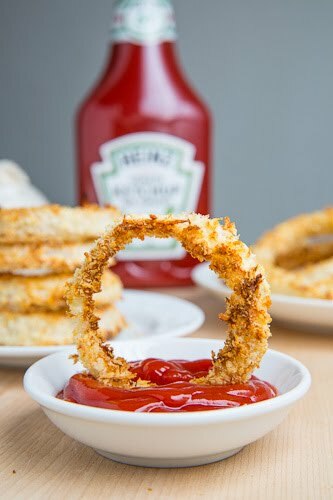 Healthy, crispy baked onion rings that are so addictively good and super easy to make! With all of the experimenting that I have been doing with crispy baked vegetable fries lately, such as the eggplant parmesan fries and the portobello mushroom fries , I cannot believe that I did not think of using one of the most obvious vegetables, onions! I mean onion rings are so addictively good and they are the one upgrade that I pretty much always take if it is available when ordering out. 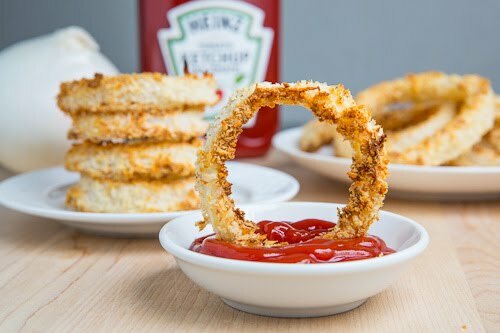 My initial thought was to take the same recipe that I had been using for the other vegetables, where I dredge them in flour, dip them in egg and then coat them in panko bread crumbs, and although it worked and they tasted great, it was not all that easy to coat both the insides and outsides of the onion rings with just two eggs! I am all about easy recipes and the first recipe was just not easy enough so I put my thinking cap on and eventually I found myself thinking about fish and chips where the fish is dipped not in egg but in a batter and I had my solution! Using the batter it was super easy to coat the onions rings, the bread crumbs stayed on and the baked onions rings tasted fantastic! Now I can enjoy onion rings whenever I want at home! I served the onion rings with both ketchup and chipotle mayonnaise for dipping. Given that the batter is just a mixture of flour, a liquid and an egg, the next time I make these I am going to use beer for the liquid and they will be beer battered crispy baked onion rings! Place half of the flour in a wide shallow bowl, mix the remaining flour with the buttermilk and egg and place it in a wide, shallow bowl and mix the panko breadcrumbs, creole seasoning, salt and pepper and place them in a third wide, shallow bowl. Dredge the onion slices in the flour, dip them in a mixture batter and dredge them in the breadcrumbs. Place the onion slices on a wire rack on a baking sheet and bake in a preheated 425F/220C oven until golden brown, about 12-16 minutes. My youngest son will be so thrilled! Great Idea! These look simply scrumptious! Can't wait to try with both beer and then try with the buttermilk. What type of beer would work best? Yipeee….onion rings without all the fat! I just accepted they were permanently off my dietary list. Can't wait to try them! Congratulations! You have just helped me make my husband very happy. Thank you! I like how you opted for baking the onion rings. Beer batter would definitely make these taste good too. thank you so much for posting this recipe! i have tried several recipes for baked onion rings but haven't been quite satisfied. i will definitely be trying this method next! they look beautiful! thanks for sharing! Ohhh it looks like Giotto's circle…just perfect! Anonymous: I was thinking about Guinness but really you could not go wrong with a beer that you enjoy drinking. I've been on a frozen onion ring kick lately but homemade is always the right way to go! These look great. they look great, can't wait to try them out. This is an ideal snack idea for tea time. It looks crispy and delicious. I would definitely try it. Awesome!!! I love pankoing and baking everything! Such a less fat-filled way of enjoying all the good stuff! Good idea on the batter! I've never baked an onion ring but I fry them frequently. I love the baked idea and will try these this weekend. Healthy and crispy baked onion rings?? AMAZING! Can't wait to try! These were really really really good! I'm going to try it with zucchini sticks. Thanks for sharing all your recipes! That looks soooo good! I can't wait to try this! Yummy yummy! I made your mushroom fries too, they were divine! It has uncommon look and perfect for the Christmas season. Great idea – I love onion rings, but hesitate to try deep frying fo justone person. I'm so pleased with this idea. Thanks so much it's a delightful website! I tried these this evening, and they turned out amazingly well! Super crunchy, and light. I used beer instead of the buttermilk, and found I needed to add more flour to the batter – it was too thin. Also, you never linked to the Creole spice you mentioned. 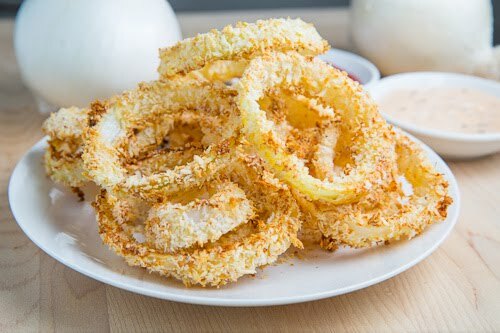 Healthy and delicious way to cook onion rings! My ultimate favorite! Yummy! Made these for dinner tonight, with fried chicken, ironically enough. ; ) Definitely, a labor of love. I had to increase the time by at least five minutes for my toaster oven. Your pics were a good guide for doneness, visually. Another fried delight! Should be amazing with roasted chicken! I had a lot of trouble getting the breadcrumbs to stick. Do you have any tips for that? Maybe my panko breadcrumbs were too heavy/dense? Still tasted great though. I made these tonight and I used beer, good, dark beer. It was a little tricky getting the panko to stick but I figured that out. They were delicious! And to my amazement you can taste the beer! 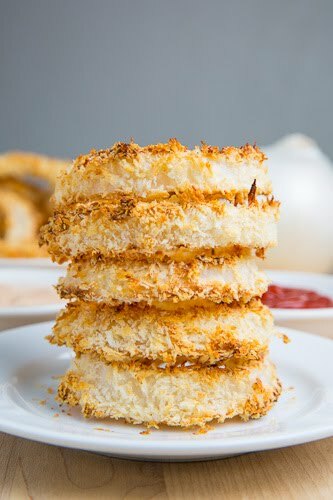 FareTheeWell: Make sure that the onion rings are covered in the batter, place in the panko bread crumbs and cover with crumbs and they should easily stick to the onion rings. These were AMAZING! Thank you, thank you! Have you ever tried this method to make fish for fish & chips? Made these with beer and they turned out wonderfully. Can't wait to make them again. this looks so good! can't wait to try this. Got them in the oven now…they smell AMAZING!!! Thanks so much for a great recipe. I used egg beaters and beer…fingers crossed! These were great! Thanks for the recipe–delicious! Kevin, did you know that in a pinch you can make some buttermilk by adding the juice of half of a lemon to a cup of whole milk (or even 2 percent I have done) and leaving it for about 10 minutes. Really, sometimes I just don't want to buy a carton of buttermilk. Thanks for this recipe; it looks great. It took me extra Panko as it starts absorbing moisture and balling up so it won't stick to the rings. A fresh dry batch gets you going again. AnnaZed: Great tip! I will have to try it next time! I sometimes shy away from recipes with buttermilk because I worry about wasting the extra buttermilk. just made these with gluten-free AP flour, and gluten-free crumbs. OUTSTANDING! I've tried it, I love it! Today I'm gonna make your onion rings again. Thank you for sharing this recipe, Kevin! I did this with onion rings and zucchini, and they're in the oven now! Question, Kevin, do you turn them?? Stark Radio: If you place them on the wire/cooling rack then you do not need to turn them but if you place them right on the baking pan you should turn them half way through. You reminded me of this deep fried deliciousness and now I am craving for it. Looks yumm!